The Beatles' remastered catalogue arrives on 9/9/09, but MusicRadar got the whole set early and now we're giving you a sneak peak at what's in store. 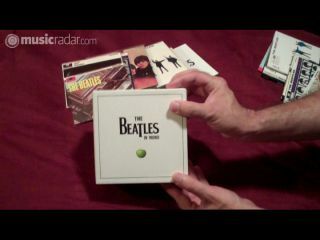 The collection comprises all 14 Beatles albums (Past Masters I and II are included, but as one disc) in stereo, with tracklistings and artwork as originally released in the UK. And that's not all: There's a second collection, The Beatles In Mono, which gathers 10 of the albums with their original mono mixes (plus two further discs covering similar ground to the stereo mixes on Past Masters). It's all quite grand, as you can see in the video. Giddy are we? Just a little. So keep it locked on MusicRadar for our upcoming review of The Beatles remasters. A splendid time is guaranteed for all!